Notions of marginalisation, responsibility and the ambiguities of nature versus nurture all collide in Antoine Cuypers’ handsome and austere feature debut, Préjudice. The film is built around enormously compelling performances from Thomas Blanchard and Nathalie Baye, as an antagonistic son and mother. They take the leads in a taut chamber piece that pulls at the loose threads of a family with a precision for excruciating social tension and a refusal to offer easy answers to thematic waters which in turn beget labyrinthine ethical tributaries. Both compassion and frustration are easy to justify throughout the drama – but precisely who is deserving of which remains a far murkier question. It is somewhat fitting that the primary conflict in the narrative is a desperate desire to go on a trip to Austria, as the spectre of Michael Haneke looms large over proceedings (and there’s even a hint of Markus Schleinzer’s Michael). It’s a similarly cool eye that takes in the unraveling relationships and exposed stitching of this family tapestry. However, while the premise may echo the underlying tensions of Funny Games‘ surface civility, or the long-buried resentment of Hidden, Cuypers is a little less exacting in his final assertions. As such, the frayed edges feel more fuzzy and uncertain than artfully obscured. Uncertainty, though, is a key component of the drama, centring on Blanchard’s 32-year-old Cédric. The reason for his effective incarceration in ma and pa’s home is adeptly kept a mystery, with only passing snippets of hushed dialogue alluding to past behaviour, or some kind of psychological condition. 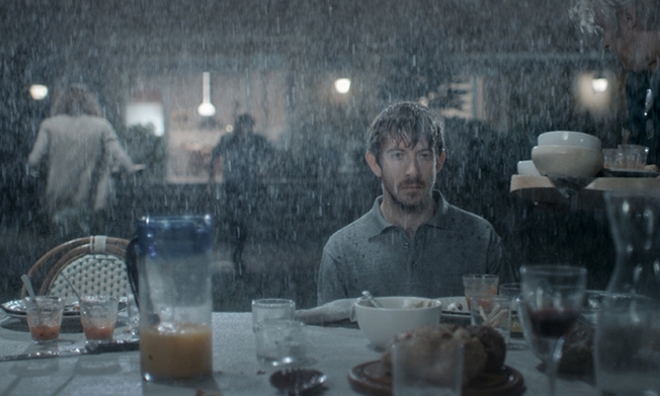 As various guests begin to arrive at his parents’ house (Bave and Belgian musician, Arno) for a family dinner party, a portrait is lightly sketched of a withdrawn, difficult son unable to communicate easily, or understand responsibility. His sister’s (Ariane Labed) response to him, and the flinching wariness of his brother’s wife (Cathy Min Jung) when Cédric is tasked with looking after his nephew, only serve to increase the unease. The drama is punctured by a literal downpour, which puts an end to the outdoor barbecue and serves to foreshadow the torrent of repressed anxiety set to spew forth. Cédric is both a clear victim and an adroit manipulator, possessing a keen intellect that is belied by his quiet, awkward demeanour. Across the table, his mother is every inch the iron matriarch – chastising her husband’s insistence on indulging their son’s fantasy vacation and immovable in her conviction that their treatment of him is born of, and represents, love. To depict this uptight middle class family, Frédéric Noirhomme’s camerawork is composed of an icy elegance that perfectly captures the various shades of emotional restraint, while all the time serving to stoke the fires of potential explosion. When it comes, it’s fiery and fantastic, but the insistence on an enigmatic denouement serves to lessen – rather than deepen – its otherwise admirable complexities. International Film Festival Rotterdam runs from 27 January to 7 February. Follow our coverage here. Préjudice is also available to stream via Festival Scope’s IFFR Live here.